If you’re looking for a simple and fun craft to do with the kids for Easter, here’s a fun one that we’ve tested and it’s pretty foolproof! For the eggs, you can either use hardboiled, or hollow some out. Eggs are super cheap this week, we chose to just hollow ours out as I’d rather not eat something that was soaked in shaving cream. To hollow them, carefully poke a hole at each end using a thumb tack or pushpin or any other sharp thing you can find. Make the hole a little bit bigger, and enlist some helpers to blow the eggs out. Use a longer needle to break up the yolk inside to make it come out a lot faster. 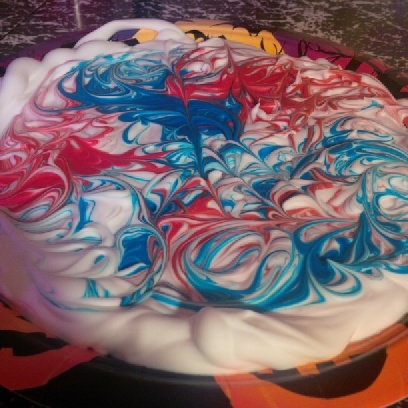 Once you’re ready, take a disposable plate (i didn’t want shaving cream on our food plates so i used old halloween ones we had) and fill it with a layer of shaving cream. Smooth it out, and add several drops of food colouring. Swirl it all up and let the kids have fun. Cover your hands with either plastic gloves or just even a plastic bag. Roll the eggs carefully into the shaving cream, get them all nice and coated in all the colours and then place them on another plate or a paper towel to set up. We let ours sit for about 10 minutes. It’s a little messy, so that’s why I recommend using the plastic gloves and disposable items. 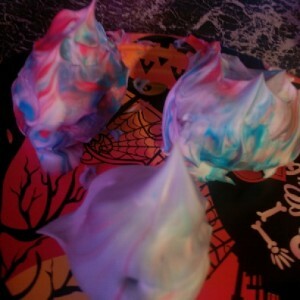 The shaving cream smells pretty strong, so best to not use it on anything you’d be eating off of later. So, take a little break, let the eggs sit. Foam should be nice and thick on there too. After your break, take a paper towel and rub the eggs until there’s no shaving cream left on them. 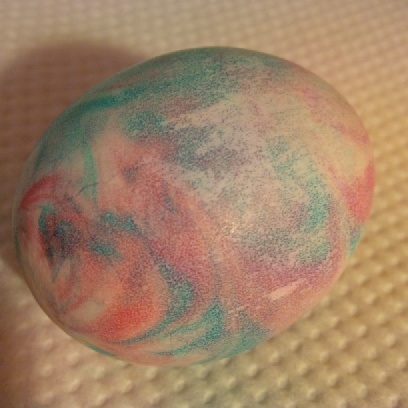 We did two plates with different colours, this egg is from the red and blue plate. We got really different results from both, so it makes for a cool assortment. If you want the colours to be darker you can let it sit a little bit longer. After the eggs are done and wiped off, kids can even decorate them just using permanent (or non permanent if they’re young) markers. Mine turned one into an easter bunny and another into an Easter scene with a cracked egg with a chick coming out – playing off the swirls and designs. Makes a nice Easter display, and very cheap to do! « Target and Hasbro Easter prize pack winner! !